If you were watching the local Ottawa news last night, you might have caught a story about local start-up called Beyond 2.0 whose philosophy is to use open data for the benefit of... well, everyone. Earlier this month, I told you about the City of Ottawa's Apps4Ottawa Contest which runs until May. And I mentioned that a colleague of mine built a fantastic bus tracker app that uses the GPS information from city buses to help you track your bus at any given moment. Find yourself at a stop you don't know? Check the app to find out which buses are coming and when. Inclement weather? Find out if your bus is delayed. Next to my social media apps, OC Bus Tracker is probably the most used on my phone. Ok, but what does this have to do with Beyond 2.0? Same app, but on display at your local coffee shop. 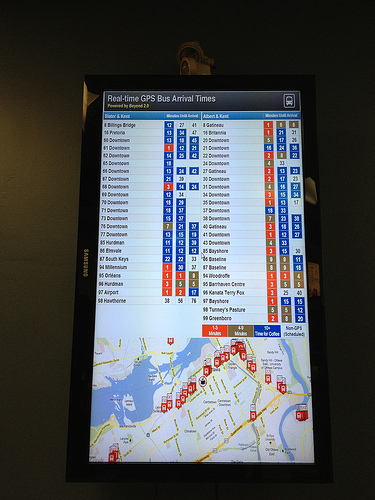 Beyond 2.0 has created a display that can show users a map of near-by streets, the ability to track bus movements, and a timetable to indicate when buses will be arriving at the stop across the street. Notice I didn't use the words: should be arriving or estimated time of arrival. No. The app is using GPS so unless something untoward happens to your bus between its current location and yours, you can tell exactly when to put your coat on and head outside. And in Ottawa winters, doesn't that just sound awesome? Beyond 2.0 will be submitting their app to Apps4Ottawa. (Which is a bit ironic, since the City wants to build these themselves and put them up in bus shelters. But we won't talk about that.) Public voting is expected to commence some time in May, but you don't have to wait that long to check it out. Head over to Treats at Albert and Kent to see the bus board in action for yourself. The mission for Beyond 2.0 is to take open data and apply our secret recipe that calls for equal parts vision and coding magic to produce a useful product or app that provides businesses with a value-added service for their customers...and hopefully makes the world a little bit of a better place at the same time! This is really the promise of the open data movement: the ability to create a whole new class of entrepreneurs that can take the raw open data provided by governments and re-purpose it into new and innovative products. Done right, this should be a win-win-win situation for businesses, government and citizens! Open data + hacking + doing good? Sounds great to me.